USD/CHF has lost a cumulative 1.8 percent over the past four days. Most analogous episodes of consecutive downside runs of comparable magnitude in the past year have been followed by significant recoveries. While this by no means guarantees an upswing and the chart certainly does not show a viable bullish reversal signal, we are bit leery to chase the pair lower by entering short at this point. As such, we will stand aside for now. 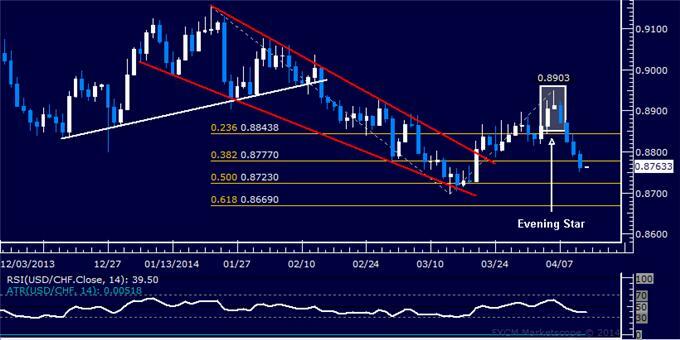 Confirm your chart-based trade setups with the Technical Analyzer. New to FX? Start Here!